With a rich looking herringbone weave pattern, you'll know right away that this is no ordinary linen walking suit but a premium Irish linen fabric walking suit by Royal Prestige. Royal Prestige makes linen walking suits only out of Irish linen which is a far superior fabric and has a cotton like consistency that will make itself perfectly known when you first touch it. 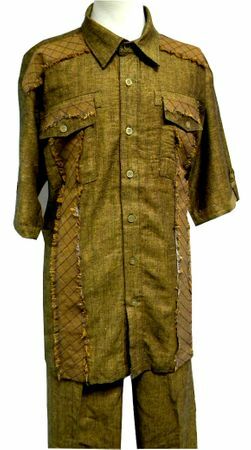 This rust heather herringbone Irish linen walking suit features a double flap pocket shirt and has diamond stitch detailing with shaggy trim giving this walking suit some additional style letting people know that this is no cheap outfit. The pants are baggy and pleated. The shirt has a baggy fit as well for comfort. Mankind has been wearing Linen since the time of Ancient Egypt. Why wear Linen? Because Linen is one of the best Warm Weather Fabrics.Linen breathes,is all natural and keeps you cool.Men's Casual Linen Walking Suits are only just a great way to look stylish and stay cool at the same time. Casual Linen sets are perfect to wear at night on a cruise ship or a tropical vacation. Linen walking suits will make you look well dressed and comfortable at the same time.